Double Time to Trade War? RAPID PACE OF STEEL PROBE DISCONCERTING: Some Democratic lawmakers could soon press the administration over concerns that a potential Trump decision to restrict steel imports to protect national security could be challenged at the World Trade Organization if the Commerce Department does not provide a convincing basis for any action, Morning Trade has learned. The United States last used the Section 232 law to consider restricting imports in 2001, at the request of two congressmen. In that investigation, the department recommended President George W. Bush not curb imports of iron ore and semi-finished steel products because U.S. national security requirements were “easily satisfied by current domestic production, and could continue to be satisfied domestically” even if imports caused a further substantial decline in U.S. output. The Bush administration held two public hearings and took eight months to complete that inquiry. It also sent surveys to about 175 U.S. iron ore and semi-finished steel producers and potential consumers, and conducted site visits at places associated with the production, shipment, and consumption of iron ore and semi-finished steel in California, Michigan, Minnesota, and Wisconsin. The Trump administration has held one hearing in the current investigation looking at the possibility of restricting all steel imports and has been striving to complete the probe in less than three months. Trump also has indicated he plans to act quickly once he receives the Commerce Department’s recommendations, instead of using the full 90 days allowed in the law to review the matter. So, as I discussed in this post, the use of Section 232 is not your plain vanilla brand of protection. As Chad Bown has characterized it, it’s the “nuclear option” of protectionist trade measures, likely to spur retaliation. [EU Trade Commissioner] Malmstrom said any general U.S. measure to limit steel imports would affect Europe dramatically, potentially threatening numerous jobs in the EU. A European response could entail a complaint to the World Trade Organization and “other things,” she said. Trump administration officials have argued that a spike in production by China has hammered the U.S. steel industry. They allege that China floods global markets with cheap steel, making it harder for U.S. producers to compete. However, since the United States already imposes restrictions on Chinese imports of steel, any new barriers are likely to have more of an effect on close U.S. allies, such as Canada, South Korea, Mexico, Japan and Germany, said Chad Bown, a senior fellow at the Peterson Institute for International Economics. In any case, aggregate statistics for the steel industry are already recovering. 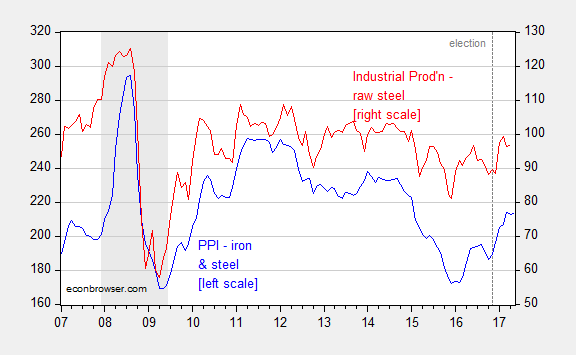 Figure 1: PPI for iron and steel (blue, left scale), and industrial production – raw steel (red, right scale). Source: BLS and Federal Reserve Board, via FRED. In addition, the concept of effective rates of protection is important — to the extent that the resulting higher steel prices feed into the production chain, it’ll harm the fortunes of steel consumers (e.g., tank producers). But, I suspect that the Administration, eager to show that it can implement some sort of policy (where it has thus far been denied success in the dimensions requiring legislative action), will opt for show over substance. This entry was posted on June 20, 2017 by Menzie Chinn. If we can leave aside the ideology for a moment. Are the Fed’s rate increases actually needed? And are they helpful to the economy? Steven Kopits: I’m not sure about the ideology comment. Is there anything incorrect in your mind in the post? Has not the administration thus far chosen show over substance when it comes to policy? Or am I missing something? I look forward to illumination. 1. You are picking on Wisconsin, with a 3.1% unemployment rate, which ties is for 7th best in the country. Really, this is the peak of mismanagement out there? Hard to make that case. 2. On the lower graph in the related Wisconsin post, wage growth in Wisconsin is essentially indistinguishable for that of Minnesota until 2016. Thus, you are arguing that the Walker effect was non-existent for five years, and then became tangible in year 6. Now, you and I both know that’s likely due to some sort of state-specific factor, the price of gophers has gone up, something like that. But even if Walker is responsible, you — as a professional economist — carry the onus to make that case. You didn’t. You just threw out the graph like a dead fish and said, “Walker killed it.” If you’re Larry Summers, say, you’ll pick that up just by glancing at the graph, and in his mind, he’ll think “superficial, careless and biased”. That positions both you and Econbrowser. Let me assure you, Jim is not superficial and careless, and he doesn’t want to be perceived that way. 3. Illinois, the next state to the south, is imploding in financial terms, and nary a post on the topic. You don’t think that’s news? You don’t think that’s relevant to its northern neighbor? You know, a lot of your readers are well-informed and pretty smart. They are hearing the dog not barking, and that also brands the site. 1. Be a progressive economics site. Econbrowser has sort of become that. Frankel is much in that mold, for example. 2. Be a straight down the middle econ website. This would be Jim’s preference, I would guess. Your challenge in this is that you struggle with the notion of producing interesting stuff without resorting to an ideological line. There is a separate skill to identifying interesting topics (I learned how to do this in Hungary.) I could probably do a good lecture on that. 3. Be a diversified website. In this case, you’re pulling in all kinds of views, left and right. I had suggested adding a couple of guys to the stable. Andolfatto comes to mind, but if you go and search the various Fed blogs (I don’t), you’d be amazed how much interesting stuff they actually write. Not hard to pull those guys onto Econbrowser, actively or passively (re-publish). Jim could live with this, I think, and that would provide you scope to publish to your tastes. In any event, that’s my view. A little more blunt than I’d prefer, admittedly. 1. Hmm. No, but Wisconsin typically has a lower unemployment rate than the country, (0.9 ppts), so the unemployment rate — which is the ratio of unemployed to labor force, both very imprecisely measured. As Figure 3 indicates, the rate is statistically indistinguishable from where it should be on average. 2. The wage graph (Figure 4) pertains the slack issue, which is Riedl’s argument about why employment growth is slow of late. However, the issue of “Wisconsin open for business” which should have had an impact on employment (that’s what the Governor and his spokesmen asserted) has demonstrably lagged Minnesota, and the Nation, and a counterfactual based on a statistical analysis that you have so far made no comment on. 3. Illinois has made it into previous analyses (as you should know, since you commented on this post). But, I aver if there is a state that is unable to produce a budget for three years, then it probably will lag. However, the question is whether it lags a counterfactual (that is really the economically interesting question), and I have not had time to conduct that analysis. 1. Jeff Frankel is what we in the academic (vs. business oriented) world of economists consider mainstream. You should become acquainted with what sort of stuff is published in AER, JPE, QJE, JME, as opposed to what’s in, say, Forbes. 2. Not sure I understand your point. Pretty much all my analysis is textbook; I can’t think of many instances where what I write deviates from the mainstream. And believe me, as a teacher of at least eight different undergrad courses over the past 28 years, I know a lot of textbooks. I think the issue is where *you* are coming from. That’s why you think I’m a progressive. 3. There is of course a lot of Fed stuff that’s great — that published on blogs don’t necessarily need more exposure. The chief constraint is economists at policy institutions (Fed, CBO, IMF) are not always free to post without approval. Just so you know. You asked for my opinion. I gave it to you. Now, as for 28 years of macro, why don’t you do a post on the impact of a Malthusian society with an aging population on interest rates? Are we living in the same world as we did in 2006? Or have we crossed into another regime, either due to balance sheet or demographic considerations, which imply that the Fed is wrong to raise rates? I would be interested to read your view, as I think many others here would. Sooner or later the Fed will need to cut rates. But in the meantime they need to raise rates so they will be able to cut them when necessary. Hopefully, the very gradual rise in rates will not do too much damage to the economy or stock market. Well, if you look at my Platts’ presentation, I point out that, in Japan, we see full employment, low productivity growth, tepid GDP growth, very little wage inflation, and all this against a backdrop of an aging and declining population. So let me ask you this. By 2035, Tokyo will be losing about 1% of its population per year. Thus, demand for housing will, ceteris paribus, be declining every year and presumably with it, housing prices. Under the circumstances, why would anyone buy a house? And if so, what mortgage interest rate pairs with this development? Can you have positive real interest rates at all? And if mortgage rates are negative, what does this imply for interest rates in the broader Japanese economy? Given that we’re going all Japan ourselves, maybe we need to be asking that question. Is the Fed raising rates just because that’s what it always did? Or is it raising rates because the economy actually requires it? I really don’t see any inflation or significant wage pressure. But I do see a collapse in commercial and industrial loans. Under these circumstances, why raise interest rates? Funny. Pushing NATO into the FSU countries was not too bright but I suppose one has to flog highly subsidized US grain and weapon systems where one can….. At least this much, Democratic and Republican presidents can agree on. Suppose Trump raises tariffs on Canadian steel. How would Canada react? By pushing back hard and crowding media, mainstream and ‘social’ with its own message. It is probably safe assumption that the full panoply of special-interest calculations that usually drive trade conflicts no longer matter. What matters in this day and age of Celebrity Narcissism is how public persona capital a leader is left with at the end of the day. In one corner we have young, quick-on-his-feet, athletic Prime Minister Justin Trudeau who can read a briefing paper and apparently listens carefully to expert advice. In the other corner, we have President Donald Trump — old, fat, slow, speaks in sentence fragments, cannot finish briefing papers, ignores expert advice, and makes up stuff all the time to compensate for his short-comings elsewhere. It is an uneven contest. Such a confrontation could seriously embarrass Americans and make them feel awful about themselves. Conclusion: The USA will avoid erecting trade barriers against Canadian steel. Menzie I think Steven Kopits wanted to talk about something else. The national defense argument has always been a little weird. We get lots of weapon systems from foreign countries. For example, the Belgian company Fabrique Nationale is the OEM for the M240 MG and the M249 Squad Automatic Weapon. The M249 uses very special steel that is only milled once a year and only in Europe. DoD gets a lot of the rare earth metal Germanium used in its advanced optics from Israel. And the M93A1 “Fox” battlefield chemical, nuclear and biological detection system is a German vehicle. Normally I am a deficit hawk and a hard money guy. And yet, the work on my Platts presentation gave me pause. If you’re looking at Japan, you objectively can see full employment, low productivity growth, and tepid GDP growth sort of cycling in and out of recession. Japan, like much of the western world, has become a Malthusian economy, in the strict sense that deaths outnumber births, and will at an accelerating pace for the next few decades. Japan’s population loss in the next several decades will be equaled only by the great plagues of the Middle Ages. Is there an interest rate which pairs with this demographic development? Normally, a growing economy is characterized by business cycles, because fixed asset growth lags demand growth, leading to asset bubbles and then crashes as fixed asset supply exceeds demand. In this world, central banks raise interest rates to cool the economy in the up-cycle and lower them in the down cycle. However, with a declining population, asset growth never lags demand. Thus, there is no impetus for a bubble and no cause to deflate one. There is comparatively low demand for capital, because demand is largely limited to replacement stock, rather than growth. This would seem to argue that interest rates will be chronically low, and therefore the Fed’s prescriptions for raising interest rates using pre-2000 models may be wrong. It also suggests that countries can carry much higher levels of debt — as we see with Japan, and frankly, the US — but that once that limit is reached, spending growth must be highly constrained. Thus, I am inquiring about the linkage between interest rates, fiscal policy and demographics in a post-Malthusian society. I actually think that’s a pretty important macro topic. Stephen Kopits once again demanding “ME ME ME ME” like a small child. Whenever he is bored by what everyone else talking about he demands you change the topic to what he wants to talk about. We are speaking of a peasant rebellion, or the modern equivalent thereof. Peasant rebellions occur when the elites have failed and the ‘takers’ of policy, the Average Joes, want to change the system as a whole. This leads to the rise of populism, which involves promises which are inherently contradictory. The elites say, “4+0=4”. That’s math. The Average Joe says, “That’s great, except we’re the zero.” So Bernie says, “0+4=4”, which sounds great, but implies tanking the ‘makers’. But it has an appeal. By contrast, a Trump will say, “4+2=4”. We can have more without cost! We can put on tariffs without retaliation, without any effect on domestic prices, or any follow on impact on US jobs. Now, the elites will protest, “4+2=4 makes no sense. You can’t just conjure stuff from thin air.” And at some level, the Average Joe knows this. So you’re going to see a good bit of rhetoric, but very little action. Peasant rebellions fail 90% of the time, by definition, because they are led by peasants, and not elites. The Average Joe will protest, but he lacks the confidence to back a radical change in policy in conflict with the experts. For me, the whole tariff thing is a non-story. Trump lacks the ideology or conviction to really go through with this in any significant way. He is neither an ideologue nor policy expert. In his heart, he is a showman and salesman. In the end, institutional continuity will carry the day. That’s why I didn’t bite very hard on this story. By contrast, I think Fed interest rate increases are a quite current and important topic, and well worth discussing in a Malthusian light. Steven Kopits: So economies with stagnant populations are Malthusian economies? Strange. Strange because Neo-Malthusian crisis usually refers to fast regional population where the population outgrows its capability to feed itself given its level of technological attainment. Ironic too. Because a number of rich developed countries exhibit low if not stagnant population growth and also exhibit excellent socio-economic results — often better than the USA. Malthus contended that population could grow exponentially, while resources to feed population would grow arithmetically, thus, resources — notionally, food — would provide the binding constraint on population. In principle, per capita income would remain or fall back to (or as the case may be, rise to) subsistence levels, which were interpreted as consistent with starvation or near starvation of part of the population, such that the population would be controlled by lack of food or disease. Malthus fell out of favor because, obviously, fewer people are starving to death than ever before, even as the globe supports it largest human population in history. Malthus referred to these as ‘positive checks’ on population. Malthus also discussed a second check on population, called ‘preventive checks’. These included sexual abstinence and birth control (even in 1798!). With the rise of feminism; low cost effective birth control methods; extended years of education; rising cost of child rearing and the such, birth control has become very much an option. This then negates Malthus’s presumed natural propensity of society to increase its population. In country after country, at higher income levels, we see fertility fall below replacement level. Japan is only one example. Korea is even worse. And China is falling into that range as well, as is most of western Europe and the non-immigrant population of the United States. In terms of ‘preventive checks’, these are Malthusian societies. They are unable to hold their own populations steady and in some sense, are falling below subsistence levels. Now, it is important to note that ‘subsistence’ is not the same as ‘starvation’. Subsistence can also be defined as the level at which the population believes that it cannot afford to raise enough children to replace its dying members. In the advanced countries, we are there today. A society can be wealthy and yet below subsistence level. That’s a very important point. This is not a trivial issue. In Japan, as you can see at the link below, the working age population will fall by around 40% from 2000 to 2050, and the aged population increases. This process started in the late 1990s and is running at full force today, and we see with it unstable GDP growth, low productivity growth, very high government debt, low interest rates and yet full employment. Now, the question is whether the monetary and fiscal policy of, say, the 1980s is suitable for Japan today. We are also coming over the hump (at least in terms of rapid increase in the retired population) in the US, too. Should the Fed be trying to impose the models for 1980 on 2017 America? I would note that, under these circumstances, the classically liberal and conservative ideologies’ objective functions diverge. In a classically liberal society, the individual is the unit of analysis, and the objective function is the maximization of individual utility. In a conservative framework, the unit of the analysis is the group, and we are trying to maximize group utility, which we might consider as, say, GDP. In a Malthusian (post-Malthusian sounds better, doesn’t it?) society, the sum of the individual objective functions no longer aligns with the aggregate objective function. The individual is better off by making society as a whole worse off over time by not having enough children. This matters for collective obligations, for example, defense or social transfers and payment of interest on the national debt. Thus, the interest of the state in a larger population would come into conflict with the interests of the individual in enjoying higher aggregate utility over a lifetime with fewer children. The question is how the run down in population is handled over time. I haven’t put it through a spreadsheet, but it’s not particularly hard to envision the disposable income of the average Japanese worker in 2050 being lower than it was in 2000. That’s Malthusian. There are some strange views here on monetary policy. The Fed used a combination of jawboning and actual hikes, in this tightening cycle, to keep inflation expectations low. So, fewer hikes were needed. Therefore, monetary policy remains highly accommodative to facilitate growth. When interest rates are low, there’s less risk of deflation. The fact the Fed hasn’t reached its 2% inflation target with the Fed Funds Rate a little over 1% eight years into the expansion reflects the success of monetary policy. Of course, we can’t expect U.S. politicians to manage capitalism, through fiscal and other economic policies, as well. We typically end up with average policies at best from politicians rather than optimal policies. There are also strange views on Trump. He has more energy than most 30 year olds, and apparently needs little sleep. He doesn’t drink or smoke. I doubt he could become a billionaire without listening to experts or his advisors. He was a Democrat before, but not a liberal or a socialist. Obviously, he’s very successful. He even won a U.S. presidential election with no experience. He made many decisions that proved to be the right ones, and defied the pundits, on both sides, including those with statistical models. He has reduced the credibility of the mainstream media, who was against him, substantially. Yet, many people still grossly underestimate Trump.